Have you ever noticed that the air smells salty in some places on the Chesapeake Bay, while in others it does not? Have you ever noticed that the air smells salty in some places on the Chesapeake Bay, while in others it does not? The salt you smell has to do with the salinity, or amount of salt, in the water you're near. On the upper Bay in Maryland, where the Bay's salinity is lowest, you probably won't smell that “ocean” smell. But near the mouth of the Bay in Virginia, where salinity is highest, the air may smell very salty. Of course, this “salty air” test isn't exactly scientific. Salinity is scientifically defined as the number of grams of dissolved salts present in 1,000 grams of water. It is usually expressed in parts per thousand (ppt). Fresh water contains few salts (less than 0.5 ppt) and is less dense than full ocean-strength sea water, which averages 25 to 30 ppt. The Chesapeake Bay's salinity is highest at its mouth, where sea water from the Atlantic Ocean enters. As you head north in the Bay, salinity gradually decreases. Water with salinity greater than 0.5 ppt but less than 25 ppt is called brackish, meaning a combination of salt water and fresh water. Most of the water in the Chesapeake Bay is brackish. The greatest volume of fresh water enters the Bay from its northern and western tributaries, such as the Susquehanna and Potomac rivers. The earth's rotation causes a phenomenon called the Coriolis Force. Flowing water in the Northern Hemisphere deflects to the right, which means that saltier water moving up the Bay veers towards the Eastern Shore. Therefore, water near the Eastern Shore is saltier than water on the western side of the Bay. Salinity in the Chesapeake Bay fluctuates depending on precipitation and the season. In drought years, such as 2007, salinity increases because less fresh water flows from the Bay's rivers. This can have both mixed effects on Bay species like oysters, blue crabs and underwater bay grasses. Oysters have higher spat sets in years when salinity is high. However, MSX and Dermo, the two diseases that have ravaged Bay oyster populations, also flourish in saltier waters. When more sea water enters the lower Bay and creeps northward, crabs migrate to the upper reaches of the Bay and the headwaters of rivers to escape the high salinity. This northerly migration can benefit crab reproduction, as females lay their egg masses further up the Bay rather than near the ocean. 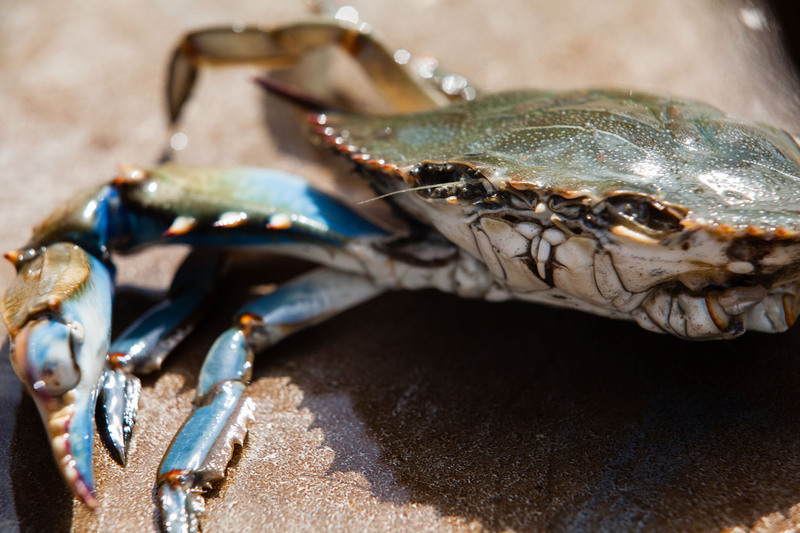 Their location, coupled with decreased fresh water flow, allows crab larvae to stay closer to the Bay, where they are more likely to survive than if they were swept out into the ocean. 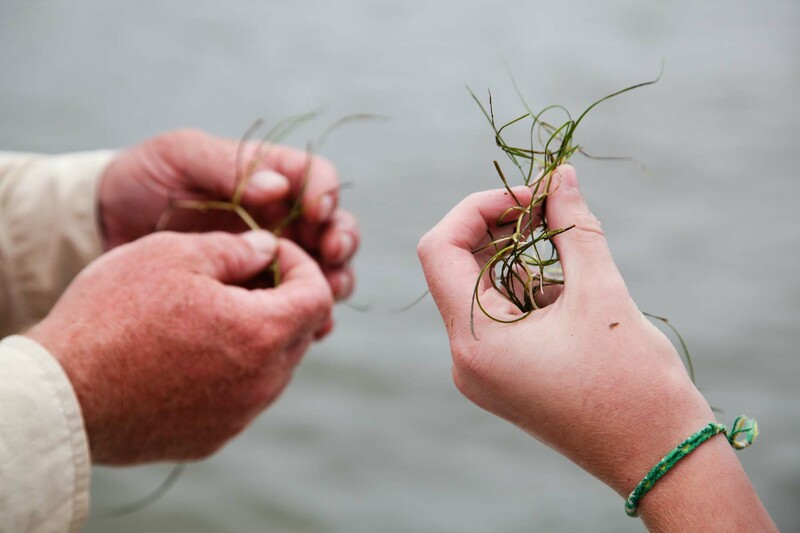 Dramatic changes in Bay salinity can have adverse effects on bay grasses because most species specifically require either salty, brackish or fresh waters to grow. Since bay grasses cannot migrate with changing salinity, they ultimately die. 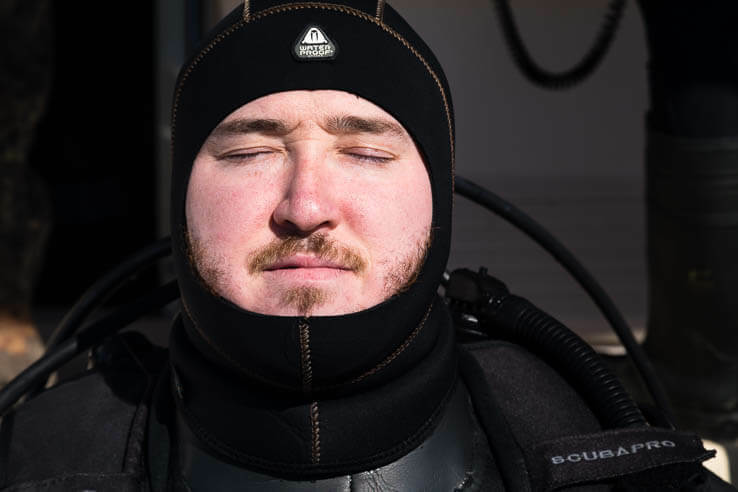 So the next time you're by the Bay — whether at the beach, on a boat or in your neighborhood — take a deep breath and enjoy the salty (or not-so-salty) smell of the air. While it may simply be a breeze for you, the amount of salt you smell means a lot to the critters living below the water's surface. Great question! The salt in the ocean comes from the land as rain reacts with rock. Carbon dioxide in the air reacts with the water to form carbonic acid, a mild acid that breaks down the rock. Electrically charged particles called ions are formed, and the dissolved ions flow through the water to the oceans. Chloride and sodium, two of the most common ions in the seawater, are “salty.” Rivers and streams are continually refreshed with springs and rain, but the ocean collects ions from all the rivers that flow into it and keeps them. As ions build up, the ocean becomes salty. As more salt flows in, salt is also deposited out. As seawater evaporates, salt content increases. When it becomes oversaturated, the salt is deposited on land to become sedimentary rock. Some salt sinks to the ocean floor in sediment, reacts with lava or clay to be absorbed, or is sprayed up onto the land to be lost as salt deposits. The ocean ecosystem itself extracts some of the salt from the water, with some creatures using them to create their shells or mineral deposits in the ocean. Together, the salt being lost and the salt flowing in has historically kept the oceans’ salinity levels in balance. Intense storms, melting ice and increased rainfall can throw the salinity out of balance, disrupting ocean currents and temperatures. can you add a section/ an article on where the salinity comes from and how it gets there. Thank you. i found this very informing. This was so helpful with my reaserch. I wish this article was more helpful of where salinity areas are and how it affects some ecosystems. I have been doing a lot of research and this wasn’t very helpful then I thought. Also for the young learners who are doing a research like me, fun fact crabs can change gender. WEIRD right!!! Also the bottom of a female crab who hasn’t laid eggs have a less pointer bottom. From everything I have learned about crabs in the bay, crabs grow better in less salty water. But females must migrate south to lay their eggs in saltier water. I have lived at the mouth of the Potomac River for 26 years, and have never seen a sook crab with eggs. I have witnessed plenty of sponge crabs at the mouth of the bay. Wow this was SUPER helpful! this article made me do good! This helped me so much on my research!